An Apollo 11 lunar sample return bag, which was previously the focus of a legal dispute until it was auctioned in 2017 for close to $2 million, is again the focus of a lawsuit brought against NASA by the woman who sold it. Carlson originally purchased the 11.5-inch-long (29 centimeters) "lunar sample return bag" for $995 in February 2015, at an auction held on behalf of the U.S. Marshals Service in Texas. Unaware of the bag's history other than that it had been forfeited by a museum curator indicted for the theft of other space artifacts and that it was described by the Marshals as having been flown on an Apollo mission, Carlson sought the help of Ziegler at the Johnson Space Center in Houston to further identify the bag's provenance. After testing the material stains inside the bag, a process that may have resulted in the bag's fabric being torn, Ziegler determined that the trace dust was from Tranquility Base, the landing site of the Apollo 11 first moon landing mission. 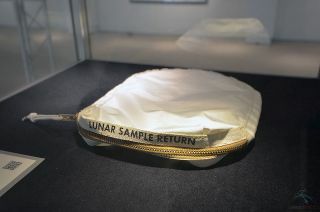 The zippered pouch was subsequently identified as having been used to prevent contamination of an initial contingency lunar sample collected by Neil Armstrong during the early minutes of his 1969 moon walk. Detail shot of the Apollo 11 lunar sample return bag showing areas that have been darkened with traces of moon dust. Without record of the artifact having been released from NASA property, Ziegler, representing the space agency, refused Carlson's repeated requests for the bag's return. In response, Carlson filed lawsuits against NASA in both Texas, where the bag was then located, and Kansas, where it had been forfeited. The cases revealed that the bag had been incorrectly cataloged by a Kansas museum where it had been on loan from NASA, resulting in its mistaken forfeiture as part of a restitution order against the convicted curator. Still, a U.S. district court judge found that, because the U.S. Marshals Service had proceeded with the sale and Carlson had made a good-faith purchase, the bag was no longer NASA's to claim. "NASA was a victim in this case, not a wrongdoer," Judge J. Thomas Marten of the U.S. District Court of Kansas stated in his ruling in December 2016. Subsequently, a judge in Texas ruled that NASA had to return the Apollo 11 bag to Carlson, which was carried out in February 2017. "NASA is obviously disappointed by the decision of the court," a NASA spokesman said at the time. "This artifact was never meant to be owned by an individual." Video still showing Nancy Lee Carlson receiving the bag back from NASA with what appears may be a tear or damage. On July 20, 2017, 48 years to the day after the bag was used on the lunar surface, Sotheby's auctioned the artifact for $1,812,500 million on Carlson's behalf. Prior to the auction, Sotheby's estimated the bag to sell for $2 million to $4 million. Carlson is now claiming the damage done to the bag during NASA's testing and its discouraging public statements deprived her of reaping the full value of the artifact, as well as caused her personal distress. Carlson's current lawsuit is now the second pending before a court in Kansas over alleged moon dust. In June 2018, one of Carlson's attorney's in the original lunar sample return bag case filed a separate lawsuit on behalf of Laura Murray Cicco of Tennessee, claiming a vial of "moon dust" in Cicco's possession was at jeopardy of being confiscated by NASA given the space agency's actions in the Carlson case. Cicco's case is now pending a ruling on the government's motion to dismiss.